ELBOWS. NOT JUST TALKIN’ PASTA. Home → Sports Medicine → ELBOWS. NOT JUST TALKIN’ PASTA. Elbow factoid two: “Tennis elbow” is inflammation or irritation of tendon that connects the lateral epicondyle to the rest of your arm, and it’s caused, believe it or not, mostly by forehand swings. It’s also caused by your arm and wrist trying to control your swing at the end of your follow-through. Finally, it’s caused maybe by just overuse, or something totally unrelated to tennis. Elbow factoid three: Golf elbow is inflammation of the inner, or medial epicondyle, and it’s caused by your wrist and arm trying to control your golf swing. It, too can be caused by overuse. Elbow factoid four: It’s all in the wrist. Obviously, of these four facts, we paid the most attention to the last. How can something that’s obviously pain in your elbow be caused by your wrist? Remember “Dem Bones“? Everything’s connected. The same mechanism that operates your wrist also connects later on up your arm. And if your wrist isn’t in a neutral position–flat out–you’re going to activate either tendon. You know, kind of like when you spend six hours on a bike. Here, too, Daniela noted that it’s important to keep your wrists in a neutral position. What’s that mean on a bike, though? “You know when you hold your hand up, like in the ‘Stop!’ position?” she said. 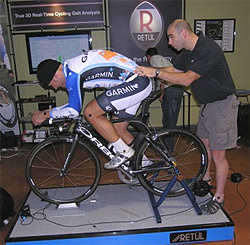 “That activates your lateral epicondyle. So keep your wrist flat and your grip loose, and you shouldn’t have a problem.” The same is true in the opposite direction, she added. 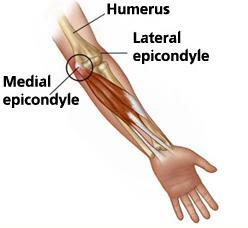 “If your hand drops below your wrist level, you’ll aggravate the medial epicondyle.” And how stupid would it be to get golf or tennis elbow on your bike? What’s that? Yeah, we were surprised too. But apparently, the lack of lever on a Wii machine–that is, lack of an actual golf club or tennis racquet, can help, since your body’s not struggling to deal with the added weight and swing of your club or racquet. 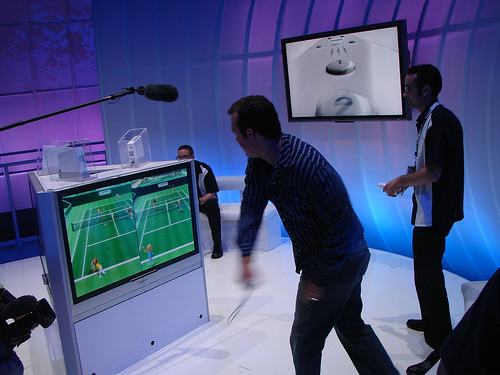 Makes sense to us, and anyway, we’ve never turned down a game of Wii tennis or bowling. And what should you do if, despite all that, you do end up feeling that sharp pain that’s so indicative of an elbow problem? “Rest, ice, compression, elevation,” says the good doctor, but a visit to your PT for a set of exercises is in order, and perhaps a change of setup or grip. Stay active but neutral. That’s good advice, and we hope it’ll keep us–and all of you–from getting golfer’s elbow while you’re on your bike, or tennis elbow while you’re mousing.